A master suite is the ultimate luxury, with an extra bathroom adding to your home’s desirability or a walk-in wardrobe bumping up your bedroom’s storage capacity. However, if you’re having to shoehorn them in, then the en suite, the bedroom or, indeed, the entire space might feel more compromised than classy – unless, that is, you try these clever space-stretching ideas. Some are borrowed from larger rooms, but all are shrinkable to work in smaller areas. 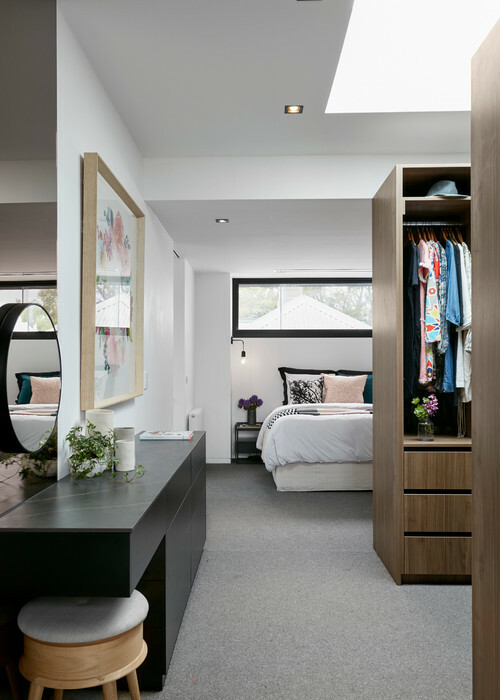 If your bedroom is long and narrow, pull the bed forwards a couple of metres and imagine floor-to-ceiling storage across the back wall behind it. Then picture a partition behind the bedhead that divides off the two zones, and you’ve conjured up a fantasy walk-in wardrobe, like this one. The partition wall here is deeper than needs be in a smaller room, but the feature wallpaper – which is dominant in the bedroom area (see next photo) – does what it should in drawing attention to the bed, rather than what’s behind it. The bedroom side of the partition. Considering knocking two bedrooms into one – perhaps combining your main bedroom with the boxroom next door? Don’t just put a modest doorway between the two spaces: go for something much more ambitious. 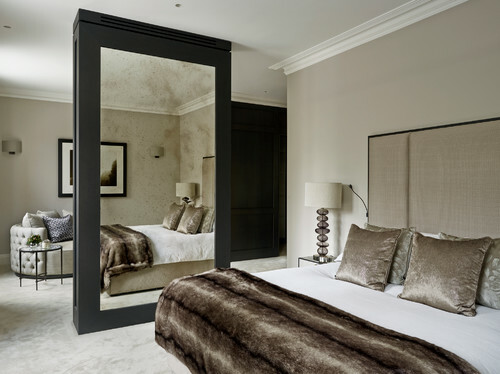 This mirrored partition does several jobs: it provides privacy, creates definition in an open-plan space, reflects light and is a great focal point. Alternatives? Replace the mirror with a convincing electric fire inset in a half-wall or amid display shelving. 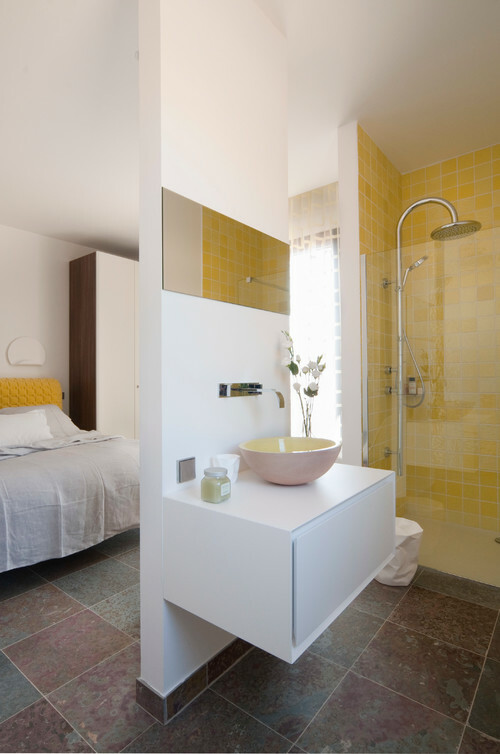 If your boxroom is teeny, a narrow doorway leading off the bedroom and into your new en suite might look more natural. 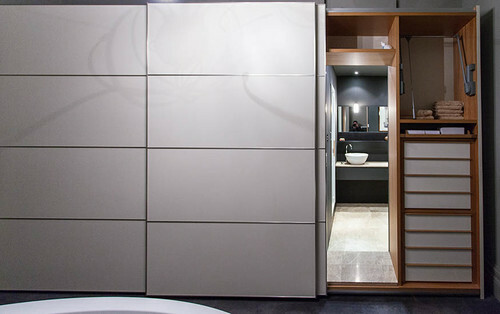 But don’t stop there: instead of wasting space around the doorway, why not make it part of a storage wall, with sliding wardrobe doors built either side and across it, so that when they’re pulled shut, the bathroom space is neatly hidden behind them? Here, horizontal stripes on the doors accentuate the room’s width, too. It might be that, with the aid of a sliding door and partition wall, you can just about squeeze a windowless shower room to one side of your bed. But how to stop it feeling like an airless cupboard? By exploiting light from above. For best effect, fit a roof light; failing that, investigate whether a sun pipe could be installed. For night time, good artificial lighting will work wonders – as will light-reflective surfaces, such as white tiles. 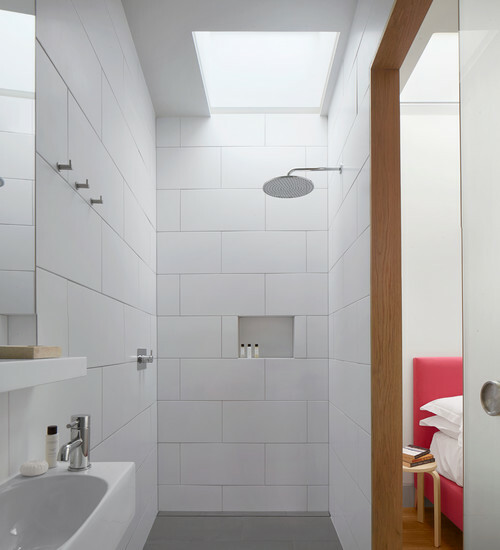 Two half-walls divide this shower room from the bedroom beyond – and both walls make the absolute most of the space available. One, in the darkest part of the room, becomes a side wall of a shower partition; the other, in the lighter, central part of the room, holds a feature vanity unit. Wall-hung furniture like this performs a clever trick: it provides storage, but leaves the floor free, which makes the room seem bigger. Forget half-walls or full partitions – why not divide your dressing and bathing area from your sleep space with a floor-to-ceiling headboard? This boutique hotel-chic example is so successful because the materials used to build it are carried through to the dressing area beyond, but you needn’t spend a fortune on hardwood when the same effect could be built with softwood by a skilled carpenter, then stained or painted to suit your scheme. It’s also a good option to consider if you don’t have enough space for the idea pictured in the first photo. 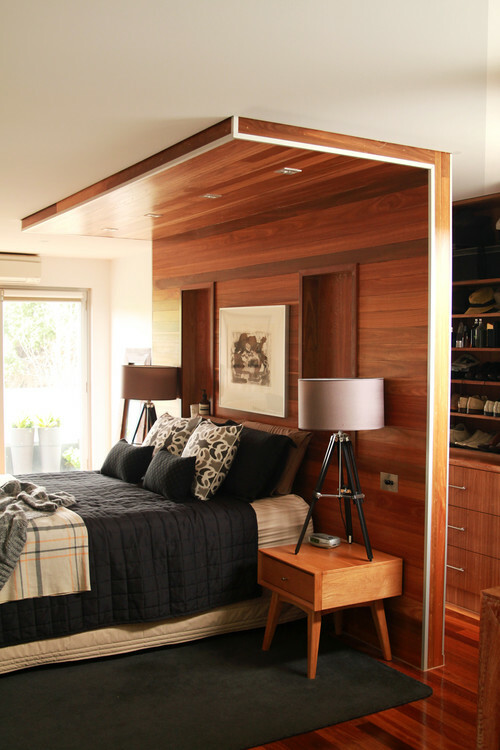 Another clever way to separate and zone your master suite is with wardrobes. To make the look work, floor-to-almost-ceiling wardrobes will help to exaggerate the ceiling height while creating a definite division. You’ll need to ensure the wardrobes are safely fixed to the floor so they don’t topple, and that any visible wardrobe backs are smartly lined.